What did the first ever Brit actually look like? Where did he come from and how is he related to the British people today? For the first time in history, professionals from both the UK and Holland embarked on an amazing venture to answer these questions with help from the Artec Space Spider, the cutting-edge metrological 3D scanner from Artec 3D. The results of this ambitious project were astounding and forever changed the way the people in Britain envisioned their predecessors. It all started when first and only complete skeleton ever was unearthed in Gough’s Cave, located in the Cheddar Gorge, Somerset, England, a little over 100 years ago, marking an important archaeological milestone. Despite having the remains of the first Brit for over a century, conducting a full DNA analysis has only become possible today, largely due to the recent developments and breakthroughs in the DNA science field. Data, that would previously take at least 3 years to generate, today, can be acquired in just 24 hours! One of the first stages in reconstructing the appearance of the Cheddar man was scanning the recovered scull with the ultra-precise Artec Space Spider 3D scanner, performed by Artec’s gold certified partner, Patrick Thorn & Co, capturing the 3D data in high-detail at an accuracy of up to 0.05 mm. Initially designed for use on the International Space Station, this 3D scanner, paired with the all-round Artec-Studio 12 scanning and post-processing software, was the best possible solution for this project, capturing fine details of the scull, such as teeth, perfectly. Taking only 12 minutes to capture the whole of the scull and a little over 30 minutes for post-processing, the print-ready 3D model was done in just under an hour. The final STL file of the 3D model was then sent to a Dutch company, Minke Products, to 3D print a 1:1 scull on an Ultimaker 2 extended 3D printer, using the PLA material. Mere 19 hours later, the Kennis brothers, one of the best prehistoric 3D model makers, already had the exact replica of the Cheddar man’s scull, so that they can begin the reconstruction of the facial tissues, skin and hair based on the results of the DNA analysis. While the Kennis brothers were working hard on rebuilding the face of the first Brit, using the process of adding the pins, and clay by hand, the results of the DNA test were also send to the UCL in London for further analysis. 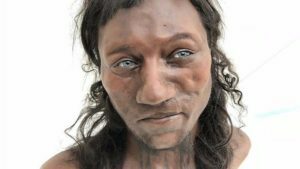 The team at the University College London examined the data to conclude what that the Cheddar Man really looked like, including the color of his eyes, hair and skin. The end results were surprising, and went against the main misconception of the general public, who thought the first Brit probably had fair skin, blue eyes and looked like a Viking! After all the hard work done by everyone involved in this astonishing project, we are finally brought face to face with the first ever Brit! Looking at the unusual combination of his very dark skin, curly hair and piercing blue eyes, the results are definitely not what anybody has expected at all! Watch the video to see the whole process around the discovery of the appearance of the first ever Brit! Artec 3D is extremely proud to have played a vital role in this aspiring project that will surely go down in history. 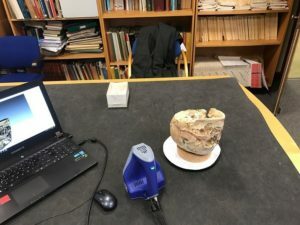 Artec 3D strives to create precise and reliable 3D scanning solutions, that have proven to be the go-to tools on multiple occasions, including the Cheddar Man project. Click here to learn more about Artec 3D products. Wondering how Artec 3d can help your project make history? Click here and someone from The SolidExperts will be happy to help you.